Don't have Smartsupp account yet? Sign up for free in just 2 minutes. 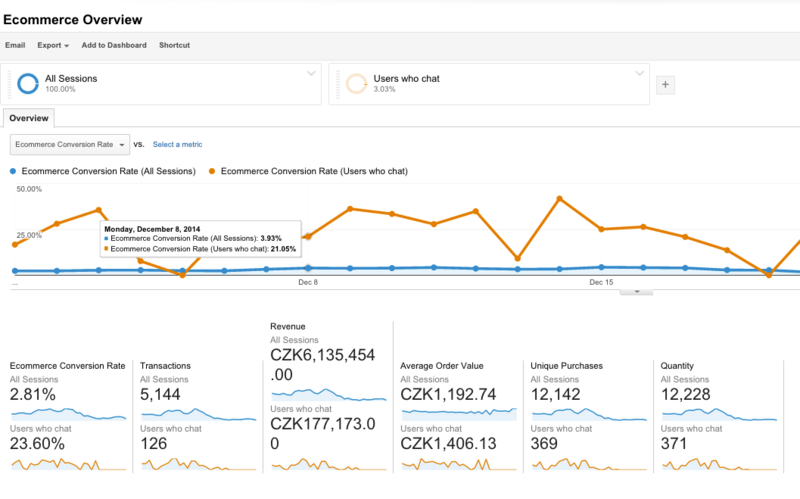 You can measure the impact Smartsupp has on your conversion rate and visitor behavior in Google Analytics. Unless you use Google Tag Manager, Smartsupp starts sending data to your Google Analytics account the moment you insert Smartsupp code on your website. Following works only in paid packages STANDARD and PRO. Are you a developer? 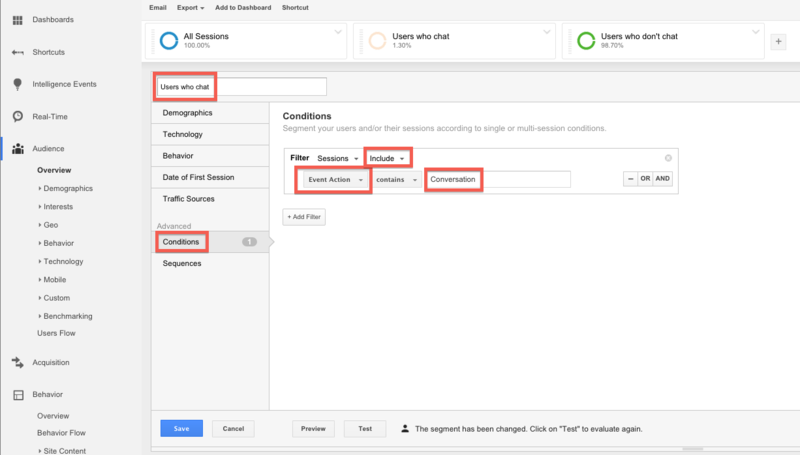 Do you need more details on Google Analytics integration? Visit our API ! Smartsupp sends data to Google Analytics as events. In total we send 6 events actions which help you monitor behavior of chatting users. 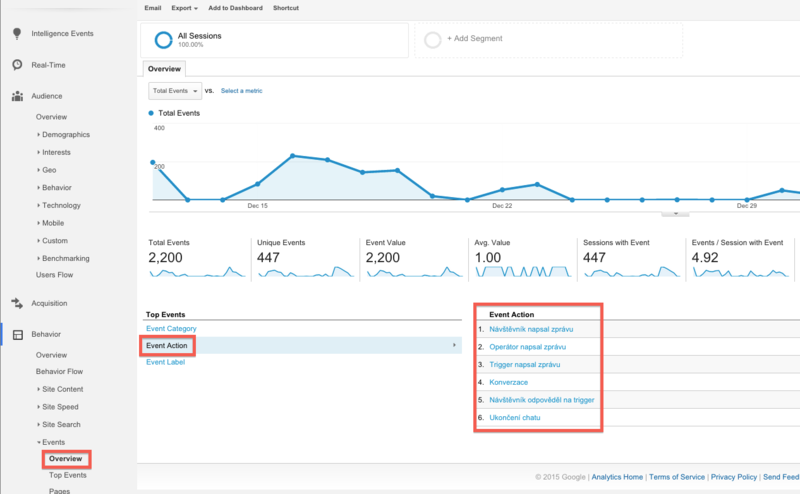 To see all the event actions Smartsupp sends to Google Analytics, go to the Event section (unlike in the picture, you will see the event actions in English). Event happens every time agent sends a message. It is possible to track agent activity. Agent can proactively start chats with visitors but user does not have to reply necessarily. Event happens every time visitor sends message via chat during conversation. Every sent message is counted. In one conversation can be sent multiple messages. Event happens every time visitor gets auto message and replies to it. This way you can track auto messages interesting to visitors. You can test which messages are most replied to. Thanks to previouse value you know how many times trigger was sent and how many visitors replied to it. The more visitors reply to trigger the better it is than other. This way you can measure conversion on your website. This event happens only once during conversation. Only when both agent and visitor write message. This way it is possible to measure how many conversations happened. This metric is obsolete and we plan to discontinue it. Please do not pay attention it. Now all you need to do is create a new segment to filter out data of chatting visitors. You can create a segment for any kind of Smartsupp event action. The most useful metric is the ‘Conversation’ event action. When you have the segment created you can see and compare behaviour of chatting visitors vs all visitors. In the example you see there were 71 chatting visitors vs 3796 total visitors. With that you can calculate 1.9 % of visitors is engaging in a conversation with you and more info. The most important thing you can measure is impact of Smartsupp chat on conversions (goals). You are able to see conversion rate of chatting visitors vs your overall conversion rate. Well done! All is up and running. Do you have any questions, suggestion of additional events to measure or want to share your data from Google Analytics? Let us know !